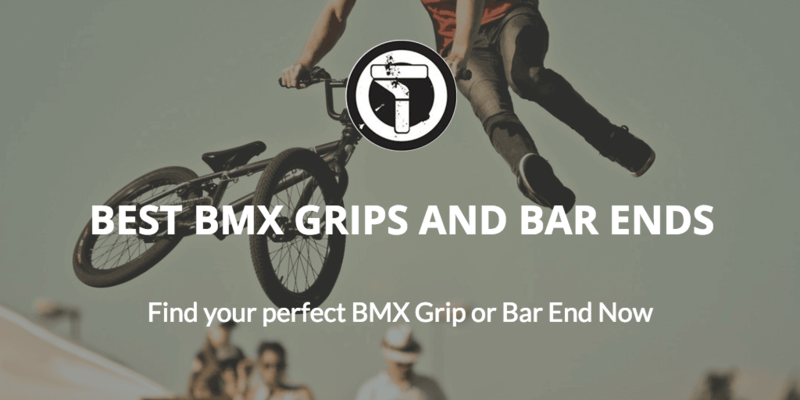 BMX grips may not seem an important part of a bike when your building or upgrading your BMX but when you see the many different aspects a grip can have you may have a change of heart. 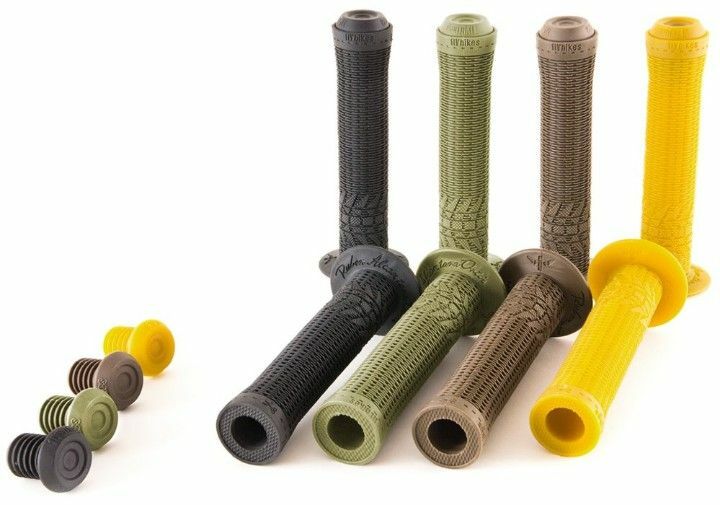 Next time you’re looking at a new pair of bike or scooter grips make sure to look at the weight, colour, size, material and the small features that make it different from the others. Just looking at grips you wouldn’t be thinking about any of this, there are so many possibilities that I thought it would be useful to go through and make a list of my favourites, favourites of other riders online and just some good looking ones I have found along the way. There are a few terms we need to go over that may be used in this article. Think of this section as a sort of glossary for this article. Firstly, flanges! Loved by some, hated by many. Flanges are the flappy, circular bits on the inside edge of BMX grips. 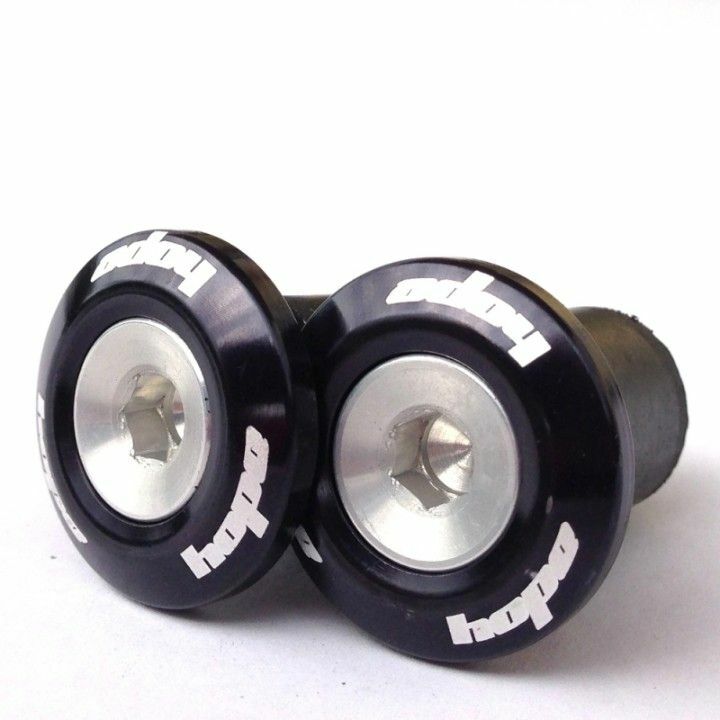 They can be small and thick like the WeThePeople Raptor grips, or larger and thin like Fly Bikes Ruben grips. 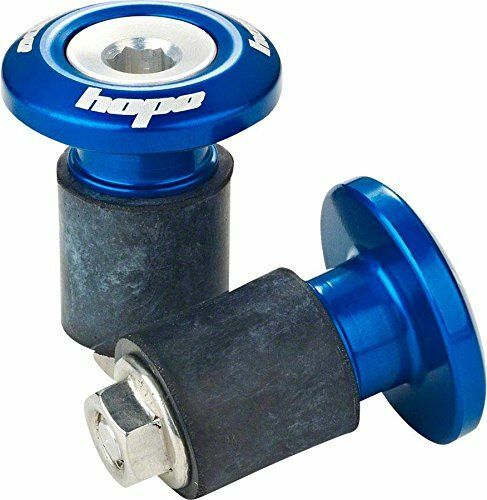 There’s no type of flanges that I’d suggest for BMX or pro scooter riders. I would only suggest you make a decision between buying grips with or without flanges. Riding parks or street, where barspins or tuck no handers are popular, I don’t think flanges are the best idea. They are brilliant for keeping your hands in a great position on your grips while giving you a little protection when riding. This means flanges are great for fast race riding or dirt jumping but maybe not for park and street riders. Length is probably far too for me to be explaining here but it’s probably worth nothing that BMX grip lengths are measured in millimetres. Be careful when buying abnormally long or short BMX grips as a few millimetres can make a big difference in riding feel. The measurement of rubber hardness is called Durometer. It’s pretty easy to notice that grips are often very different in how tough or flexible they are. A rubber durometer is measured in degrees from 0 – 100 and will give you a good idea of what you’re getting before actually using the grips. BMX or pro scooter grips are generally between 25 and 35 degrees. 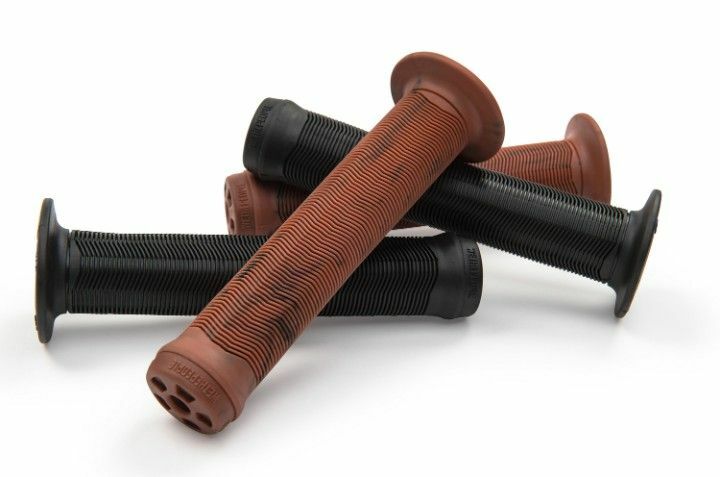 BMX grips can be made from many different compounds. They are used for adding different characteristics to bike grips. 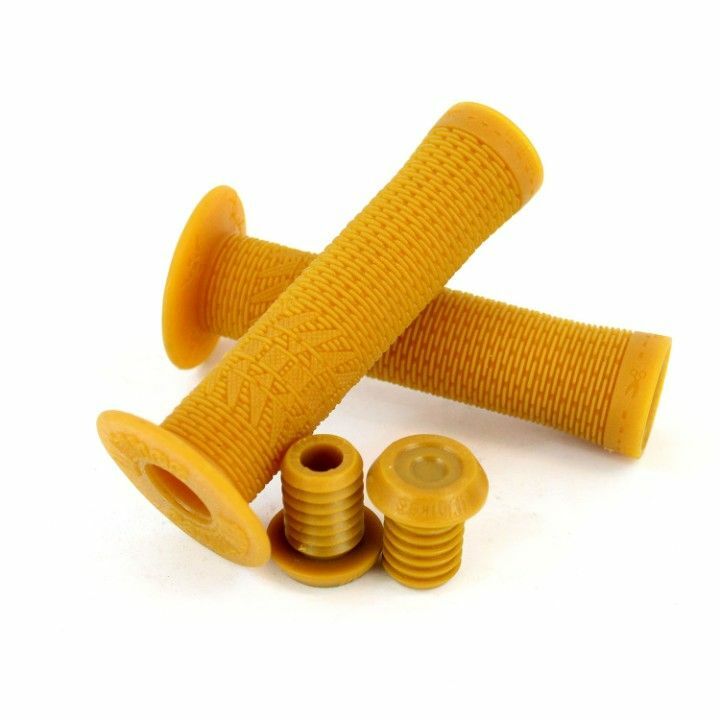 Krayton is the most popular and widely used compound for bicycle grips. VEX is another type of compound that increases durability without hurting the durometer or hardness of the grips. 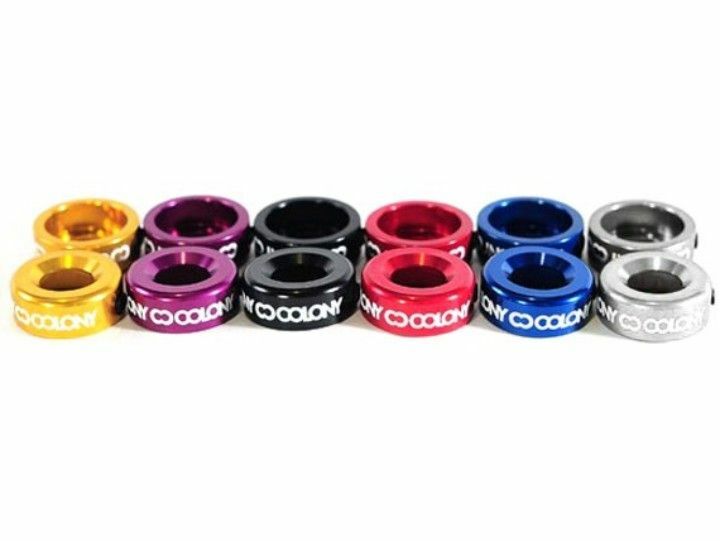 Since ODI are probably the biggest BMX grip manufacturers when Vans thought it was time to make an awesome BMX grip they went straight to ODI. Here are the Vans waffle flangeless grips. The ones pictured are gum flavour but they produce loads of different colours. When this grip was released it was very popular extremely quickly. The significant brand name attached to it definitely helped but the genius way of using the design from the infamous Vans shoes as the pattern on the grips intrigued a lot of people. The grip uses a soft rubber compound. To keep the grip soft on the hands as the pattern isn’t very flexible. The waffle grips are 10cm in length, this length isn’t too significant since they were just designed to the normal specifications. As you can see from the image, the grips come with a plastic Cult black bar end plug. 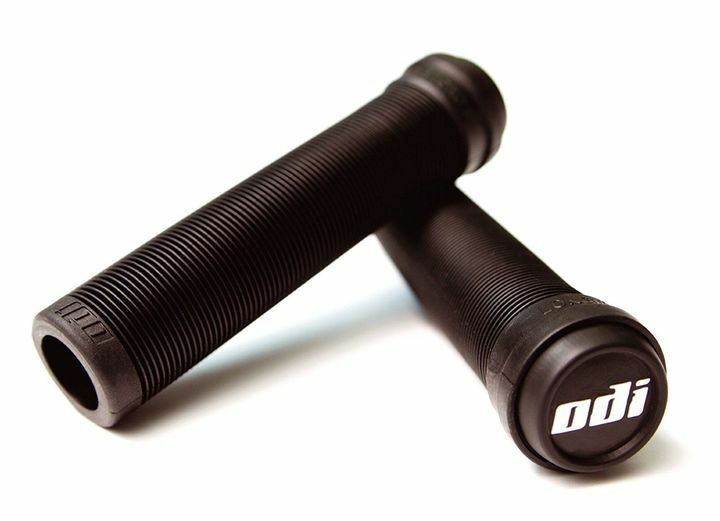 After the grips taking the market by storm and every other BMX rider bought them, Vans and ODI started designing and making flanged and lock on waffle design grips. Take a look at the images below if you are interested. 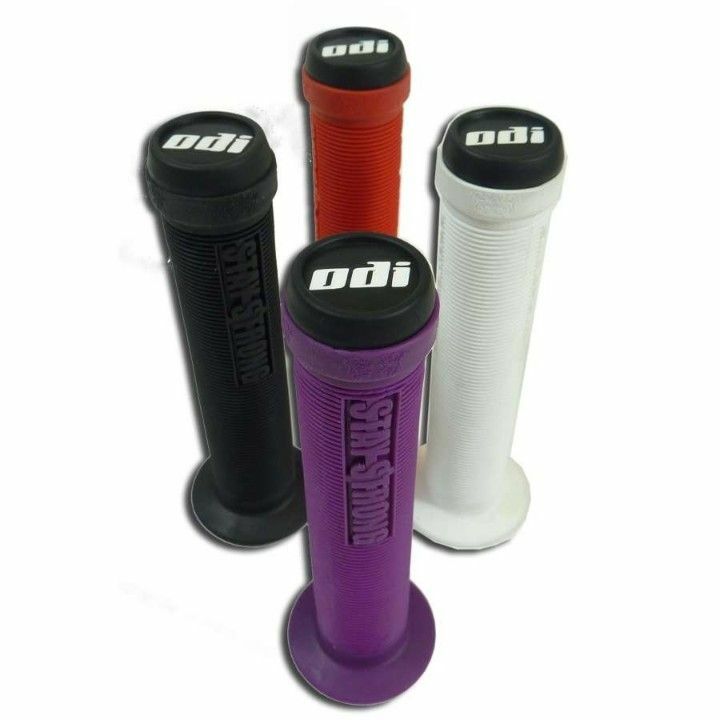 ODI Longneck BMX grips are some of the most common and popular grips on the market. 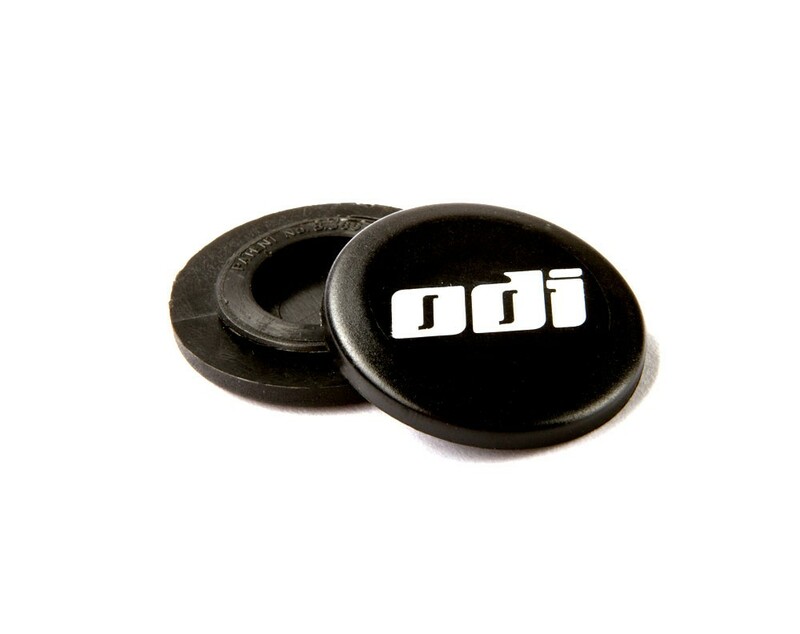 ODI concentrate their whole business on making the best grips for BMX, mountain bikes, off-road motorcycles, ATVs, scooters, sportbikes, watercraft and even snow vehicles. When a company just concentrates on one particular product like ODI they seem to start making very high-quality products. There aren’t a lot of other grip companies that have gone through the research and testing that ODI have and you will see that when looking at the range of products they have. 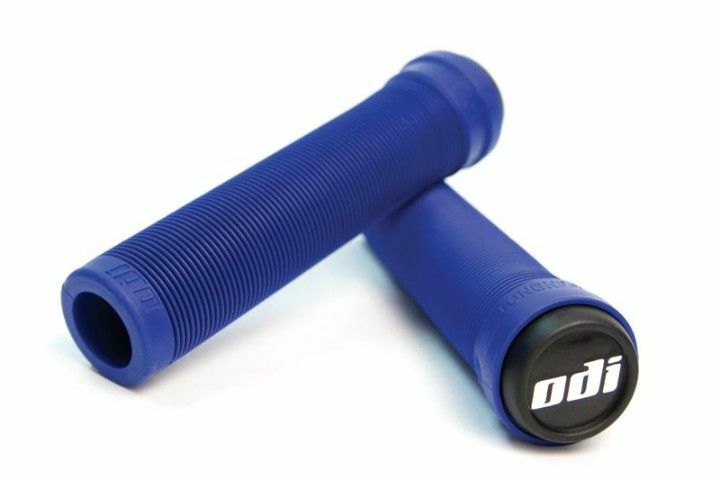 I have personally owned a pair of ODI longneck BMX grips and they are sleek, long lasting and comfortable. They aren’t trying to put extravagant annoying patterns on the grips like other companies and I love it. The beautiful grip they have on them is called a rib pattern. The Longnecks actually come in a few different styles themselves. I will include the various ones in this section because apart from two little things they are the same. Firstly there are flanged and flangeless grips. If you don’t know, that’s just the bit that looks like a barrier on the innermost part of the grip. Then there is the longneck XL and these are exactly the same as the others but they’re extremely long. They are used by riders that enjoy having their hands closer to the middle of the bars. Riders that buy the extra long bike grips tend to cut them down to their perfect size. Since they’re flangeless and have a simple design this is easy to do professionally. 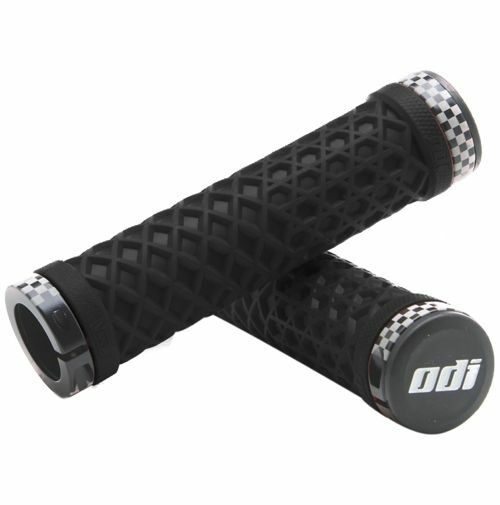 If you’re looking for the best scooter grips or grips for your motocross bike, click here to check out other ODI products, they have a lot. Ruben Alcantara is a rider I’ve been watching a bit over the years. If you haven’t heard of him, he’s a great rider that’s definitely not afraid to go big in the park. He has a gorgeous style and I think he’s riding great. These grips are part of his signature series for Fly bikes, that a few other riders have also done. 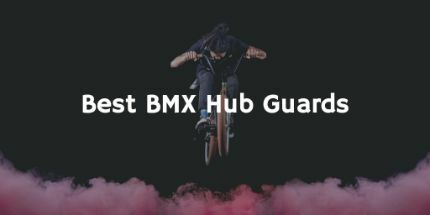 I know from experience that Fly make some great products, I currently ride the Fly Bikes Neutron, that features the Devon grips and I have never had a problem with comfort or wear with them. If you like to ride a bit harder and give your grips a hard time then the Ruben’s might be a good match for you. 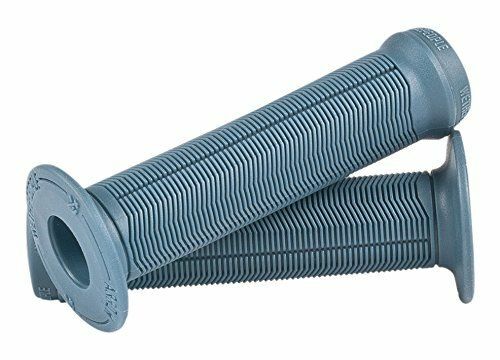 These grips are slightly thicker in diameter, with a medium softness and a conventional mushroom style featuring a new anti-slip groove design all coming together to make a perfect grip for tougher rides. The flange is a regular size and thickness, so there’s no worry about having to get used to a new style. The Eclat Sean Burns grips are probably the toughest grips on this list. Obviously, by the name you know they’re Sean Burns signature grips. Eclat themselves claim this is one of the best grips they’ve ever made although they also admit it was slightly weird designing it with Sean. The design, that is actually meant to look like a studded belt is both extremely soft and tough to wear down. 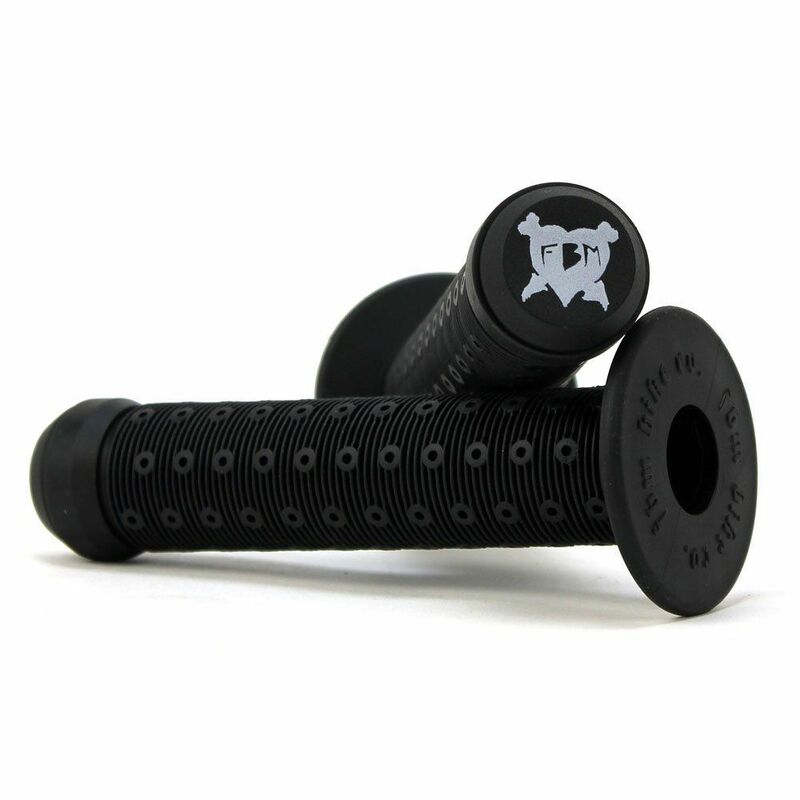 These grips are also a great way to move onto flanged grips. They are much smaller but thicker than regular flanges. As well as making them even tougher they’re also easy enough to cut off with the flange removal marking eclat have included. Eclat has used soft Kraton rubber with a hardness of 25° making for comfortable riding all day long. If all this isn’t enough eclat also throw in a pair of nylon corkx V2 bar ends with every purchase so you don’t have to go and try and find a pair to match the colour. As you can see from the image above. The pattern on the grip is actually in the design of raptor skin. To me, it looks like a solid design on a grip that isn’t going to be wearing down too quick. The Raptors are great grips for those unsure as to whether they want flanges or not. The design includes a small flange that you can feel on your hand but it won’t put you off if you grab onto it. We The People actually claim that this is one of the most popular grips among their riders. Now made with their Vex rubber compound, making it very sturdy and long lasting. Check out the link below if you want some of your own. Made in two different diameters, the 146 and the 116. 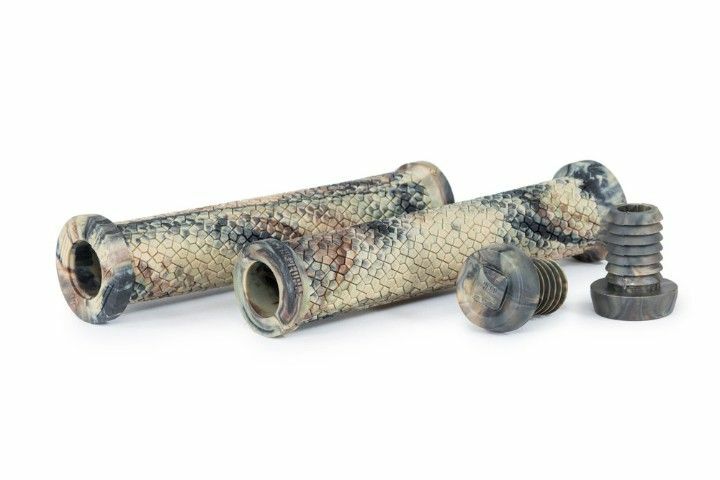 The grips have a classic mushroom style design that’s extremely soft but unfortunately, these patterns wear down a little faster than others. 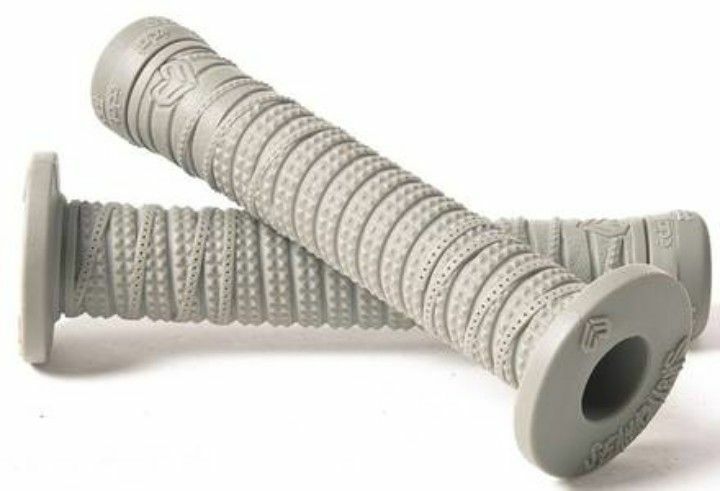 If you want comfort but don’t mind having to buy new grips a little more often, these grips will be perfect for you. The arrow grips are designed to have a durometer of 30°. If you don’t already know, durometer is the measurement of how hard or soft the grip is. This grip is right in the middle of the regular range for BMX grips. Things like jelly sweets have a durometer of about 10° and car and bike tyres are about 90° to give you an example. 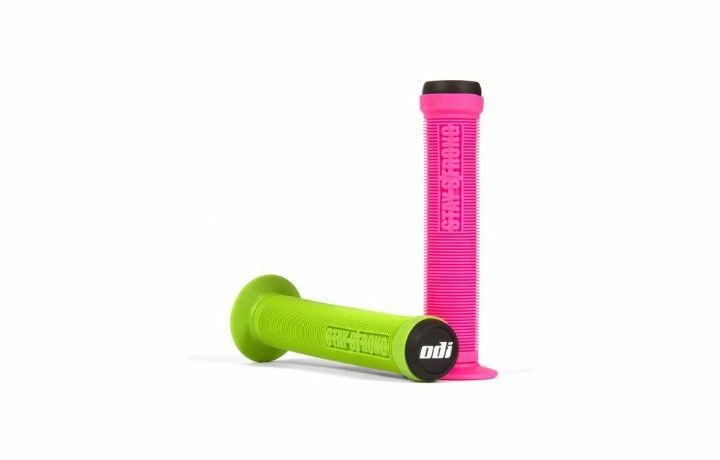 ODI Stay Strong grips are not only one of ODI’s most popular grips, they’re one of the most special. Designed after a famous dirt jump rider, Stephen Murray fell doing a double backflip and sustained substantial damage to his spinal cord. Most of his body has since been paralyzed. 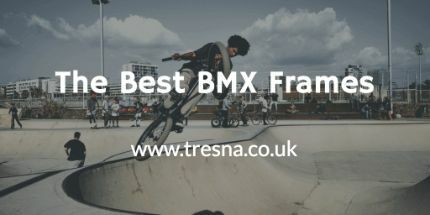 Murray was one of the most famous and skilled BMX riders in the sport of BMX, renowned for his amazing double backflips. The Stay Strong grips were designed and sold in honour of him and the proceeds have gone towards helping his recovery. 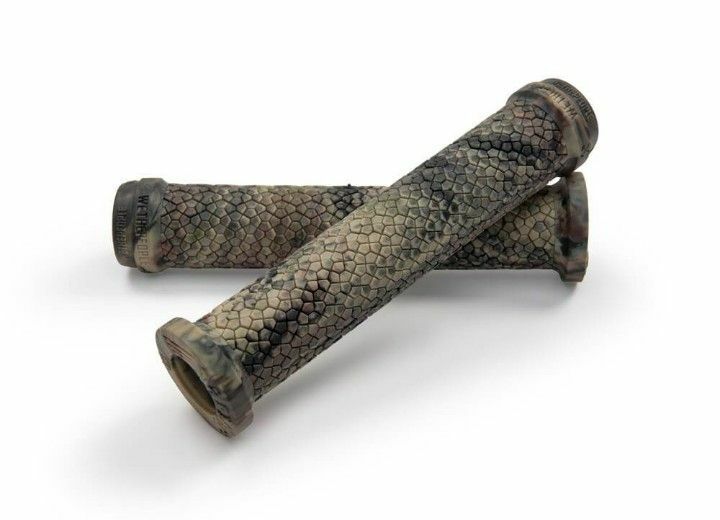 These grips are great, not only because of the story behind them but because of the design, manufacturing and materials. 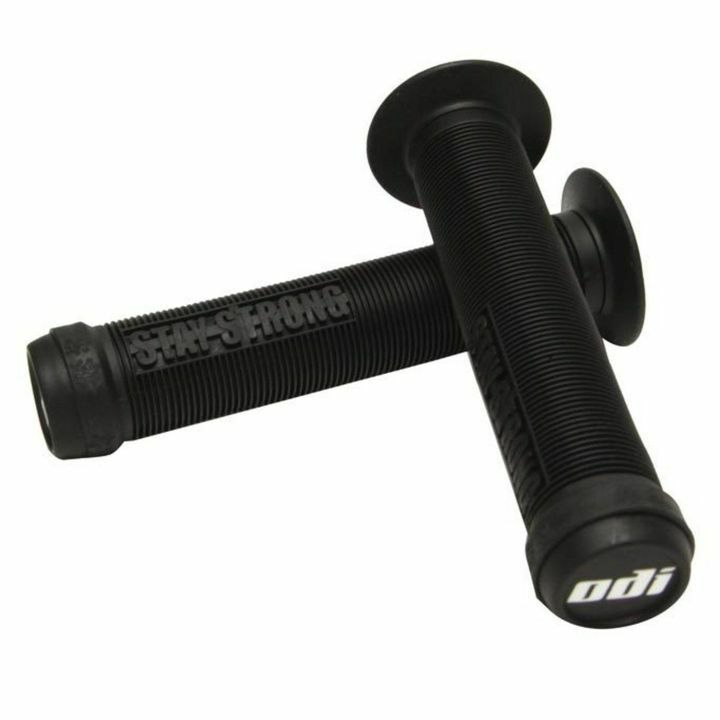 ODI Stay Strongs are made from a soft rubber compound with a thin ribbed design that a few other grips have on this list. Grips with this ribbed design are famously soft and comfortable but they do wear down fast and need replacing a little more often. Having said this, I still think these are one of my most favourite bike grips on this list. 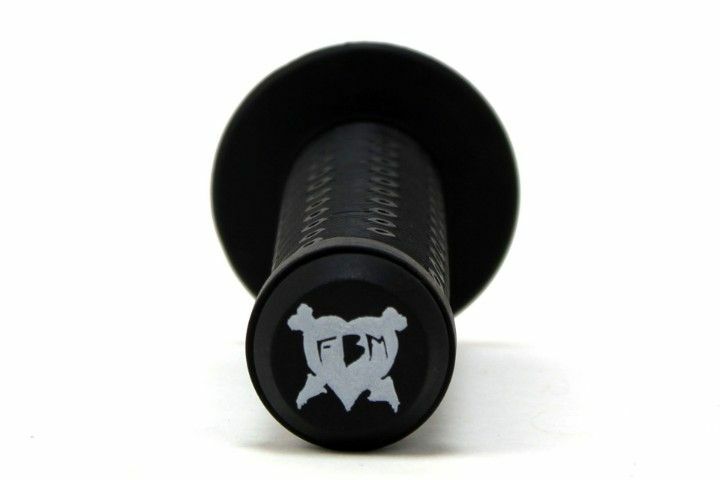 These FBM grips were actually voted to be the best BMX grips you can buy on a questionnaire conducted by a big BMX magazine. I definitely see why this grip won the competition. Firstly the colours are gorgeous. The solid black colour is a great shade and will fit in with a normal set of black bars as well. If you’re looking for a more extravagant colour then FBM have got you covered. The blue swirl colour will definitely catch some good looks when you’re out riding. 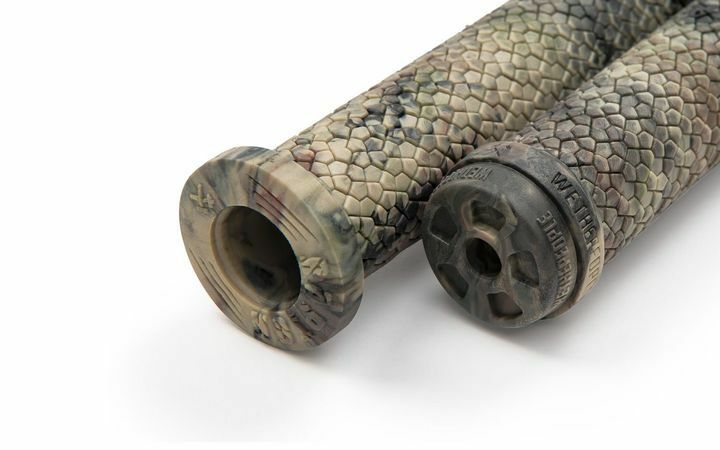 I think it’s very clever what FBM have done with the pattern on this grip. They’ve used a traditional ribbed design but also included those little circles you see too. This is done to increase durability and stop the grip from wearing down too fast. 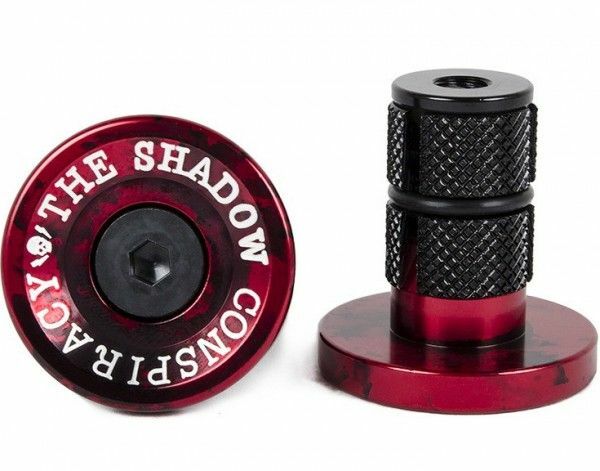 The best BMX grip for street might just be this one. Most BMX bikes have bar ends now. There are a few different types to buy and choose from but in their simplest form, they’re just something that presses into the ends of your bars to both protect you if you crash and get a bar to the stomach or face and stop dirt getting stuck inside. 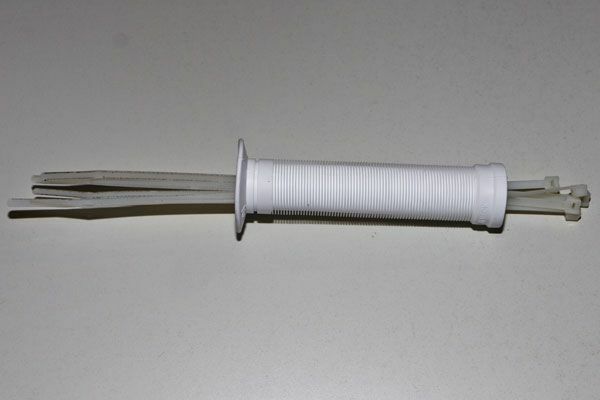 The most simple and most common are plastic push in ends and ODI are by far the most popular in this field. 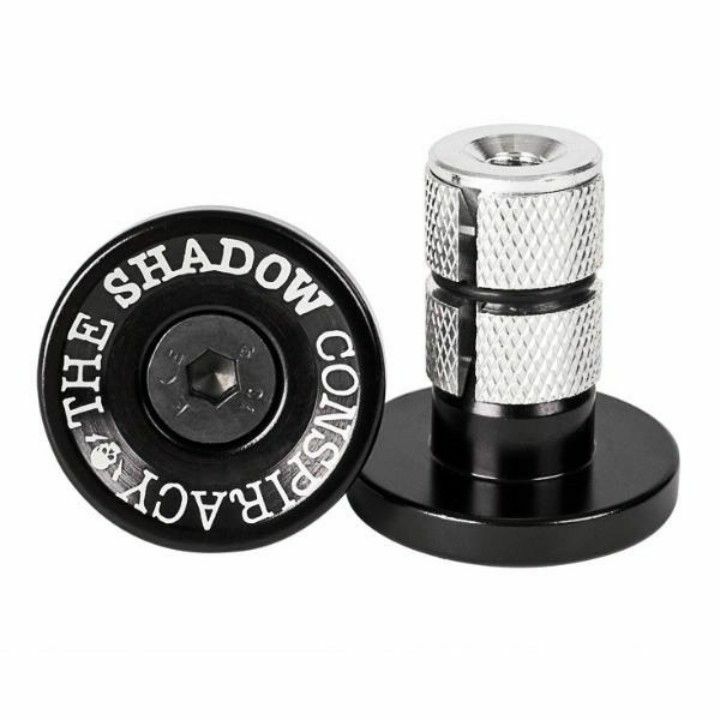 If you’re riding mountain bikes or like a little more bling then you may prefer the metal screw in bar ends made by shadow and hope. 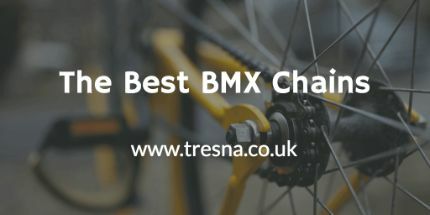 If you have more expensive bars or you ride rougher ground then it may be better to buy metal. Check out some of the bar ends below to see the best. The bar ends they produce. Bar ends are usually made of some hard plastic that you can just push into your bars and forget about and then replace in a few months. The deadbolt, on the other hand, is built to stay with you for a while. CNC machines out of 7075 alloys, it has a great even colour whilst being machined to perfection. There’s no need to worry about them falling out either, you insert them by tightening an allen bolt at the end of the plugs, This bolt matches the colour perfectly and I can’t fault any of it. These snap caps by ODI are so ingeniously made they’ve actually patented it. 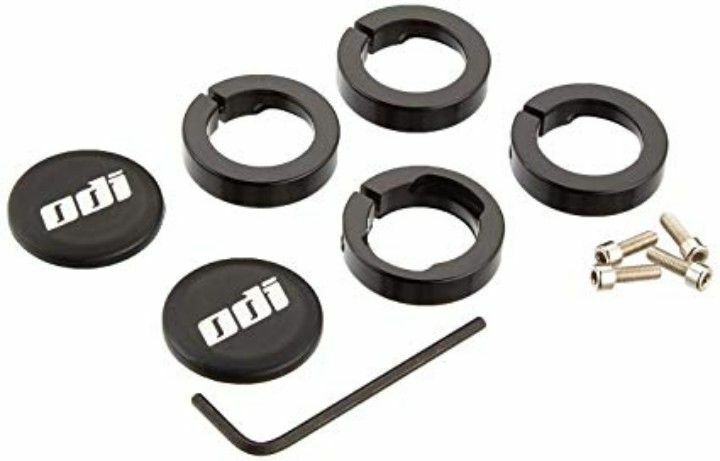 Basically if you don’t want to waste money on proper plugs or are very serious about keeping weight off your bike then you should take a look at the ODI Lock-Jaw Snap Caps. The faces are designed to look the same as other ODI plugs but they’re made from a totally different type of plastic than others. Made from a specially formulated nylon material that allows the plug to slide along concrete unlike aluminium that grabs and throws you off your bike harder. 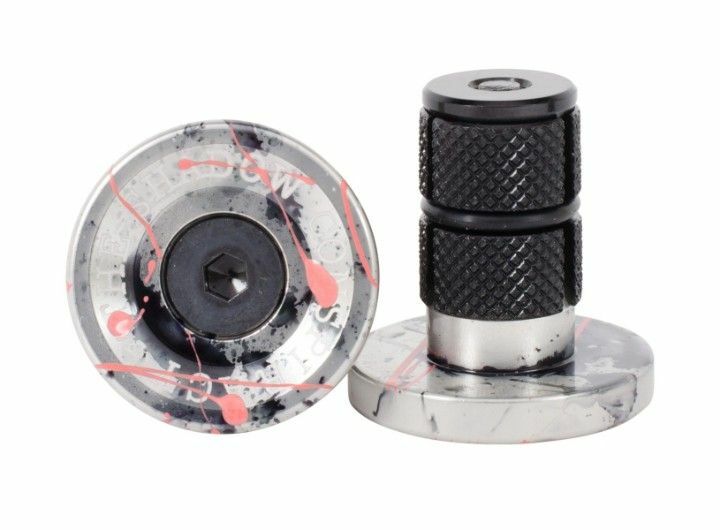 Don’t buy these plugs if you don’t have lock-on grips. Unlike what you may think when first looking at the snap caps, they don’t just snap onto the end of your bars, they’re actually placed inside the collar of a lock-on grip and tightened on that way. You can definitely tell that they’re designed to be used and replaced without worrying about damage. They are there to protect your bars more than anything. I can also imagine that having a spill onto the side of your bike with these on could easily result in them coming off or cracking but I don’t think it’s a big problem at all, they can be replaced easily. 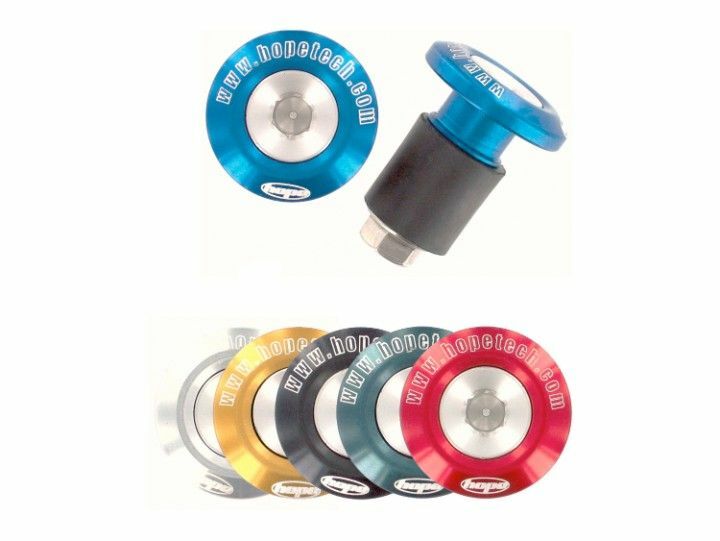 These snap caps are designed to be used when riding lock-on grips. They but up to the ends perfectly and make it look like a seamless integration. These snap caps by ODI are so ingeniously made they’ve actually patented it. 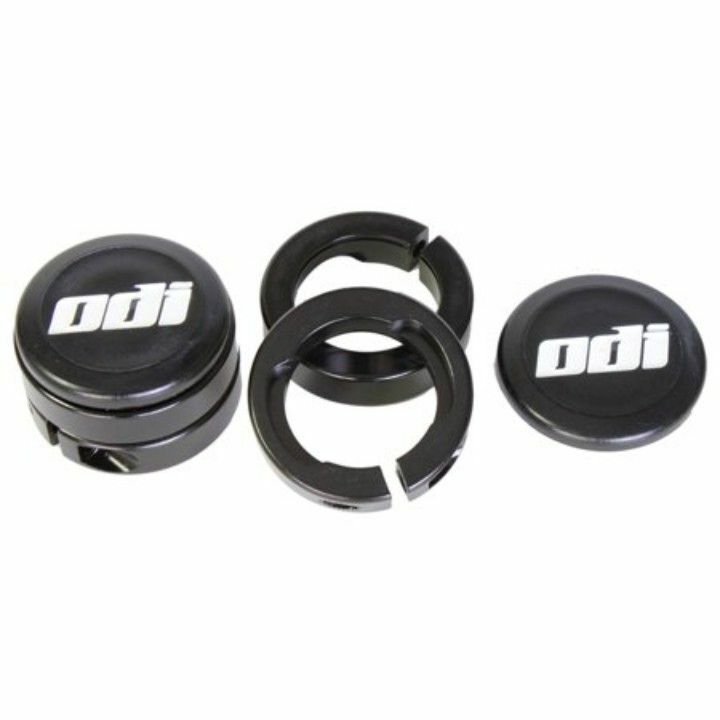 Basically, if you don’t want to waste money on proper plugs or are very serious about keeping weight off your bike then you should take a look at the ODI Lock-Jaw Snap Caps. The faces are designed to look the same as other ODI plugs but they’re made from a totally different type of plastic than others. 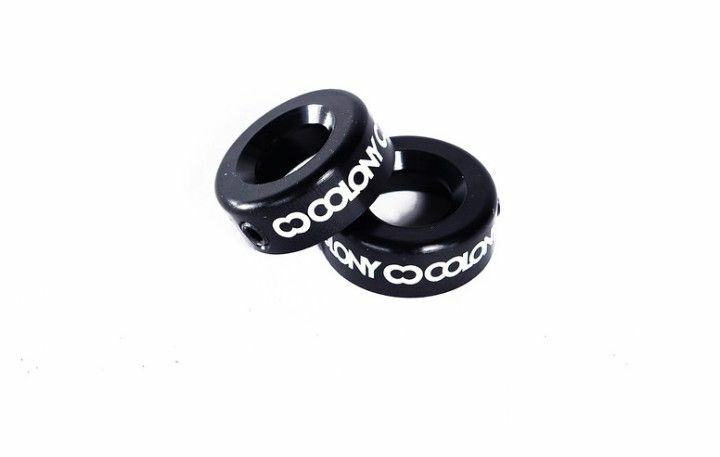 Made from a specially formulated nylon material that allows the plug to slide along the concrete, unlike aluminium that grabs and throws you off your bike harder. 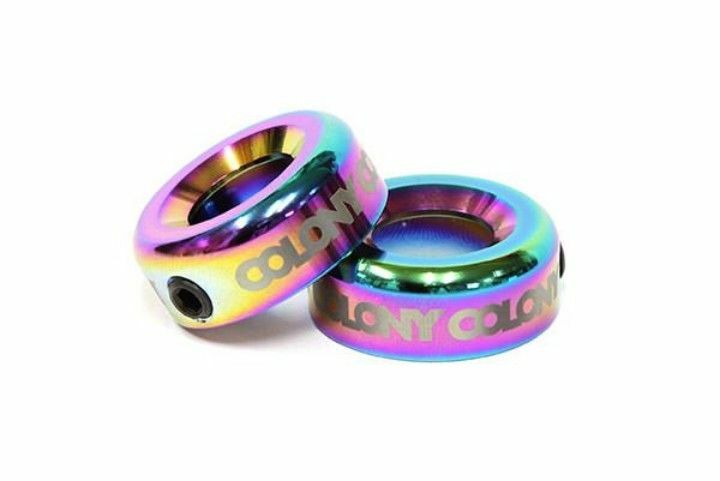 Colony Konka is the only bar ends coming from Colony. I’ve added these bar ends to the list as I think they’re pretty interesting. These bar ends are designed a lot like loc-on grips. They go over the end of the bars instead of inside them. The hole in the middle is also quite odd for a BMX bar end. One big use of bike bar ends is to stop dirt and water getting inside the bars when you put your bike down. Obviously, the Colony Konka bar ends aren’t going to help very much with solving this problem but they still look great either way and are extremely light. A question I’ve thought about a bit up until this point in writing this article. I understand that they protect the inside of your hands and provide a good place for your hands to sit when riding but are there any other good reason for having flanges on a BMX grip. In all honesty, having flanges on your bike is totally personal preference and riding style. 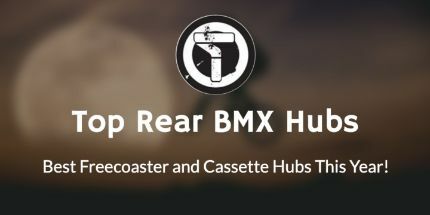 If you’re a steezy street rider that does a barspin every 3 seconds then I wouldn’t ride with flanges, catching your bars and getting the annoying flange first might start to get a bit annoying. Dirt riders, on the other hand, might like flanges for the little bit of extra security your hands will have, giving you a sure way of knowing where your hands are on your bars at all times. Since no one seems to know whether they want flanges or not anymore, many manufacturers make it incredibly easy to cut them off, some even make a thin groove on the grip at the best place to cut. Cutting them off if you don’t like them is easy and you can barely tell you did anything. 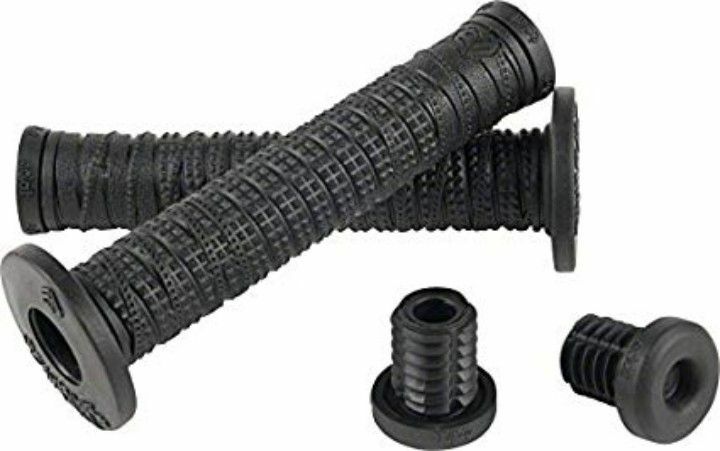 Most grips, especially in BMX just slide onto the bars and due to the grips being made of rubber and being just a little bigger than the diameter of the bars they won’t move unless water or other lubricants get underneath them. 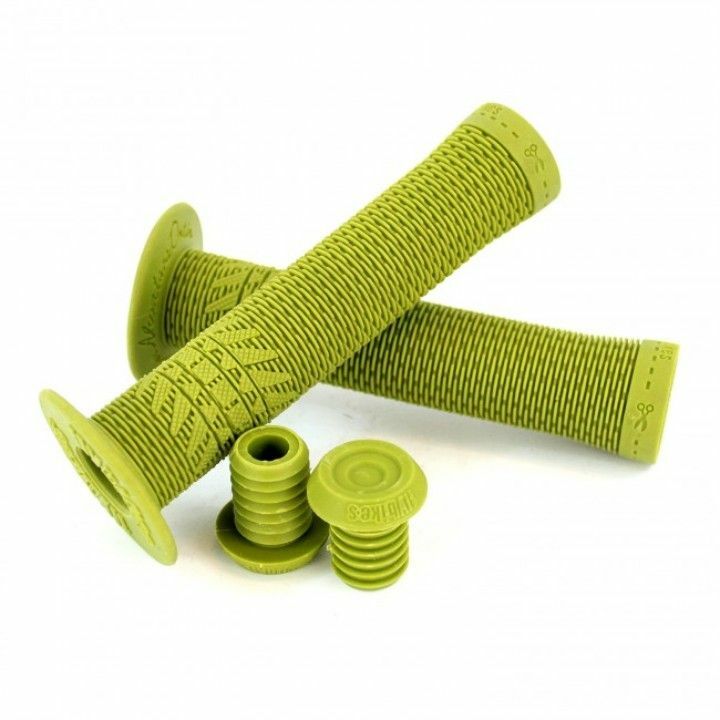 Lock-on grips are used a lot more by mountain bike riders and the likes. Lock-on grips are essentially the same rubber grip but with small metal collars at either side. I think they’re getting a lot better and much more reasonable to buy and ride with. Lock-on grips make fitting and taking off grips the easiest thing ever. I can’t remember how many times I’ve had to squeeze and push grips onto my BMX. The collars mean that the inside of the grip can be loose fitting and made of plastic so it just slides straight on. Making it perfect for testing new grips. I also think lock-on grips are much more reliable than regular ones. Having the alan bolts screwing them on tight means its a lot less likely for them to spin or slide at an inconvenient time. These are all great points about lock-on grips but there are drawbacks. Since the collars are made of metal it’s more important for lock-on grips to have bar ends for both your safety in case the metal becomes sharp and damaging metal grips costs a little more than rubber. That brings me to my next point. 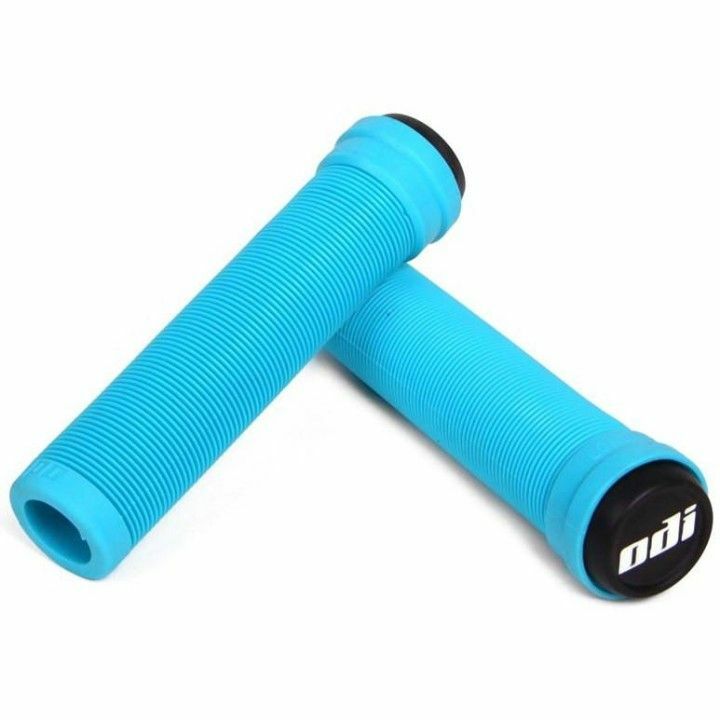 These grips are usually more expensive than conventional rubber grips and generally heavier too, a big point for some BMX racers. Just like any other hobby, after a while, you start to find great ways of getting around the most annoying things. In BMX getting grips on and off has always been one of the most annoying things ever. Trying to get a tight new pair of grips on my dry bars has often made me wonder whether BMX is the right sport for me. Now you're probably thinking “just use some washing up liquid” but as anyone that's ever tried that method will know, your grips will be sliding and turning for days after getting the grips on. Firstly, I’m going to share a great method of getting new bike grips on your bars. I came across this method whilst reading online. It basically involves a pair of new grips and some zip ties. As you can see from the image above, it’s actually fairly simple to do. 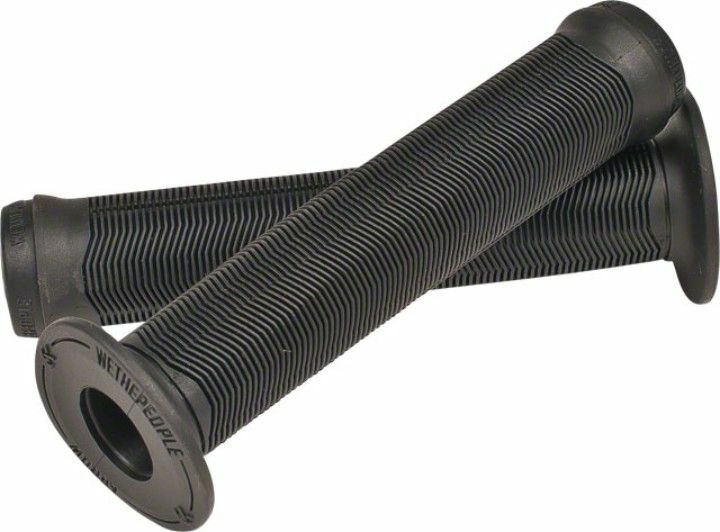 If you put four of five zip ties through the middle of your bike grip and then start to push your grips onto your bars while making sure to spread the zip ties around the bars. This works because zip ties are made of hard plastic with a much lower resistance to friction than the sticky rubber that the mountain bike grips are made from. Obviously, once you have slid your grips onto your bars you can pull the zip ties out with your hands or a pair of pliers and you’ll be able to go and ride. If you can’t get a hold of any zip ties then either using an air compressor or hairspray can also do the trick. Air compressors are usually used in bike shops where they have to do it all the time and they have a compressor on hand. I know I said previously that you shouldn’t use liquid or sprays to get your grips onto your bars but using hairspray is probably the most reliable way as long as you do it fast and you do it right. After spraying a little onto your bars you need to push the grips on fast while it’s still a liquid and is slippery. Once the hairspray starts to dry it’ll start getting extremely sticky and you’ll have a tough time getting the grips off again. 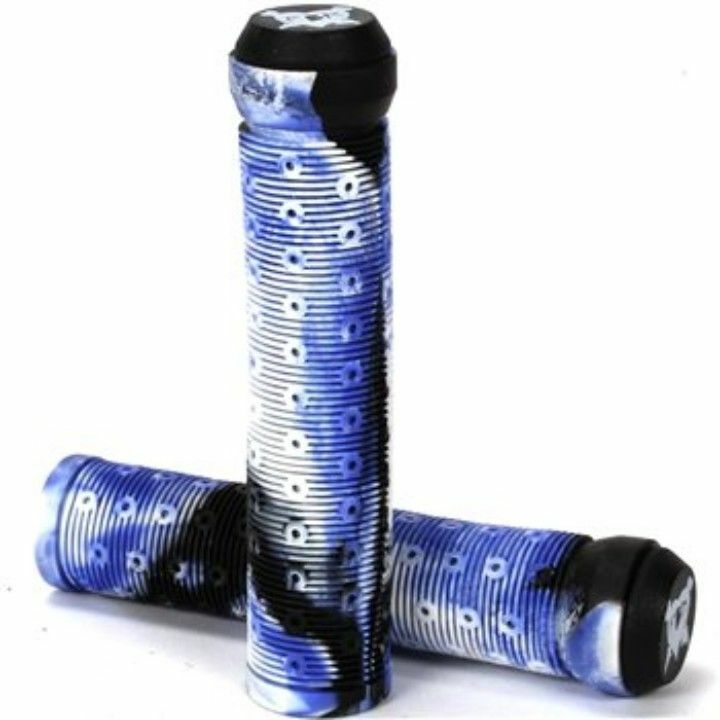 Cleaning your BMX grips is another problem bike riders often come across. You can’t simply wipe it with a cloth because it’s sticky and unless you have the right stuff you won’t get anywhere near the amount of dirt off as you want. 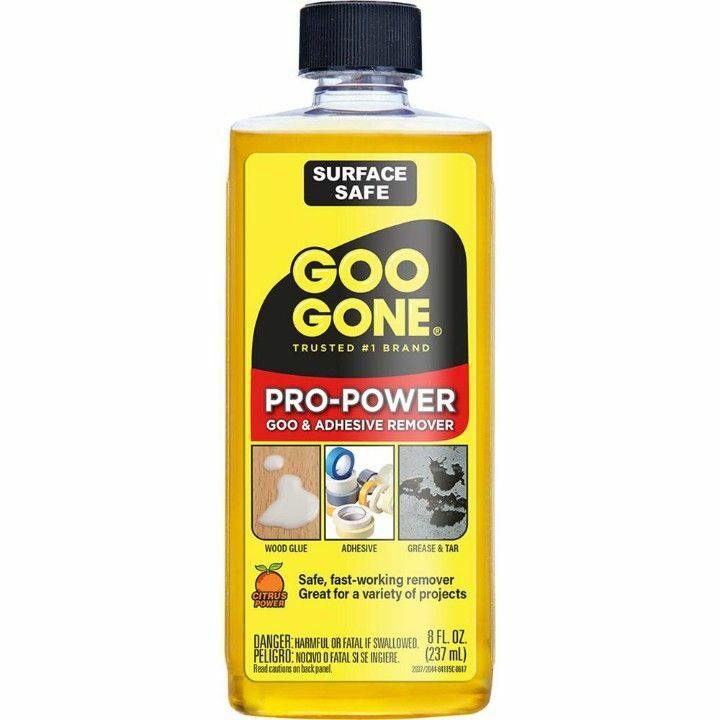 Goo Gone, pictured here, is a product loved by all in the BMX and mountain bike community. As the name says, it gets rid of all gummy, gooey problems using citrus power and scientific technology. It’s perfect for cleaning up your old, sticky grips, perfect for cleaning the gunk off your bars after you take your grips off. It’s also great for many other sticky related problems like stickers, tape, oil, blood, and makeup.